Isn't this a great picture? A modern representation of the famous Rockwell painting I've posted on the blogs over the years. Not an exact recreation, but it certainly reproduces the feelings and emotions that Rockwell taps. 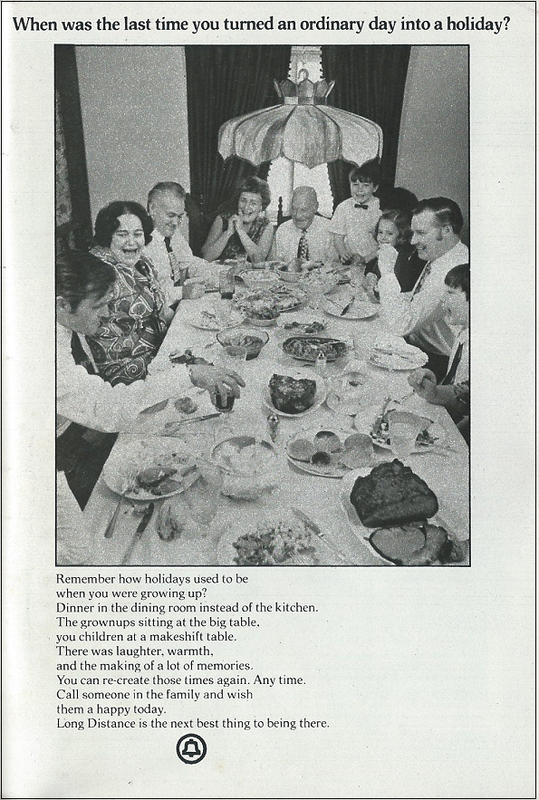 This ad appeared in the Thanksgiving 1971 TV Guide I wrote about on Saturday. The importance of long distance is hard to appreciate for those of us used to unlimited long distance on our cell plans, living in an internet age when we communicate with people around the world via email or Skype all the time. In 1971, a long distance call was a rare thing, and it made a powerful impact on those making and receiving the calls. It was something to be thankful for. The blogosphere is like that, a family that's spread all over the place but always gathers for the holidays, or a group of college friends that get together only at reunions yet maintain a connection. And today provides me with the occasion to recall how thankful I am for those of you who've become part of this community during the four years of It's About TV. In no particular order, I'm thankful for people like Andrew Lee Fielding, who wrote a wonderful book that I'd bought even before I'd had the chance to correspond with him, and has been a gracious correspondent ever since. There's Marc Ryan, who reached out to me because he noticed my interest in the JFK assassination, something his father had been involved in, and was not only generous with his time in two interviews, but has always been good for witty and informative emails. And speaking of JFK, David Von Pein has provided me not only with a very good interview, but hours of fascination with his YouTube channels. Rick29 is the man behind the Classic TV Blog Association, which has helped spread the word about the blog. (He also writes a mean blog of his own.) David Hofstede has been an insightful commentator here and gave his blog a title that describes how I feel about television myself. Mike Doran has been a commentator par excellence; he sometimes seems to know more about these TV Guides than I do. I don't think I've ever read one of his comments without learning something from it. Joanna Wilson writes a great blog about two of my favorite things, and has been kind enough to give me space there to write about them. John, the author of the blog Cult TV, is my go-to writer on British television, and is never anything less than interesting. He's also provided me with a number of shows to check out. Andrew Bayley, who writes about TV down under, has been a gracious commentator as well as an excellent writer. Billy Ingram, the brains of TV Party!, has been good enough to publish several articles I wrote for his site, and has always been encouraging to me. There are the commentators I've not mentioned by name - which is surely my fault, so please accept my apologies. I love reading the comments, because so often they add to my knowledge, but also because I get a great deal of pleasure just knowing that I've been able to provide something that others have enjoyed. I try to respond to most comments, but sometimes I fall behind. My bad, gang! There are those who've contacted me via email, either with some information they think I'd like (I do! ), or have a question they hope I can answer. Sometimes I'm very bad getting back to people in a timely manner, so thank you all not only for your interest and your kind words, but your patience! And for those of you who've liked the site on Facebook, thanks for joining me there, and bear with me as I utilize the site more in the future. All of these people feel like friends to me, because we share a love of television, and of talking (and talking, and talking!) about it. I'm enormously grateful to each and every one of you, because you make this blog possible. I love writing about television, but it would be a hard thing to do three times a week if there weren't people out there reading it and taking the time to express their thoughts about it. To those of you I've mentioned, to those of you I've unintentionally overlooked, to those of you who haven't written but who read me every week, and to the person who might be looking at this blog for the first time - thank you so much for your friendship, your correspondence, your interest in television, and for taking the time to check this site out. I am thankful for you all, and I wish you a happy Thanksgiving. Now it's on to Christmas, which we'll start to see popping up in Saturday's TV Guide! Thank you for the kind words, and know that the feeling is mutual. I am not only inspired by the quality of your writing and insights about television, but your ability to deliver 3 quality pieces almost every week, as I struggle to publish that many in a month! Thank you Mitchell you are very kind. I'm only a latecomer here but am enjoying your perspective of classic US TV as I don't follow a lot of American TV blogs. While a lot of the network shows talked about are familiar to Aussies (even if just by name) we rarely get an insight into how American TV necessarily worked back then so I always enjoy seeing your next blog post arrive. Happy Thanksgiving! That Grey Cup video is priceless! Funny, on one completed pass, I was waiting for the replay. And I recall that Plimpton Special! –Among a hundred changes since, he pointed out players received no pay until exhibition games started. Less a TV moment but an interesting episode of the times; that was also the weekend we first heard the name “DB Cooper”. You are kind to bring up my name. Happy Thanksgiving weekend and a Merry Christmas season to you and your readers, Mitchell. Thanks to all of you for your kind comments - hope you all had a great holiday (although I know you didn't have Thanksgiving, Andrew - remind me to fill you in someday on the joys of Thanksgiving turkey) and that the rest of the holiday season is kind to you as well!